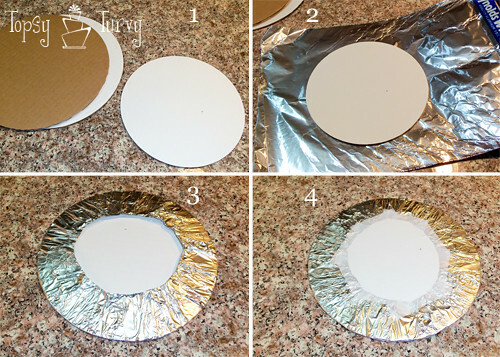 Here is the Tutorial I did last week for U-Create Parties. I like to always repost any guest post tutorial I do back here!!! Here is the Rapunzel cake I made last week for a birthday party. 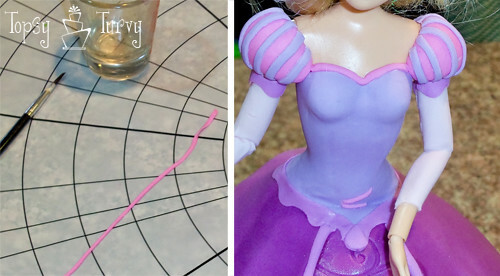 The techniques I’m going to show you can work for any of the princesses or other women doll cakes you’d like to make yourself. 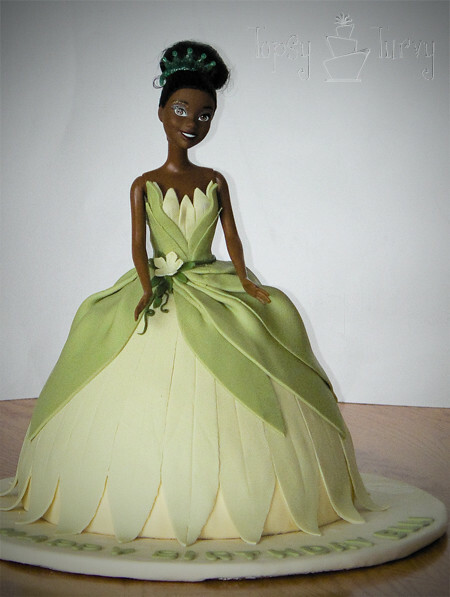 I used these same techniques to make this Princess Tiana Barbie Doll cake too! 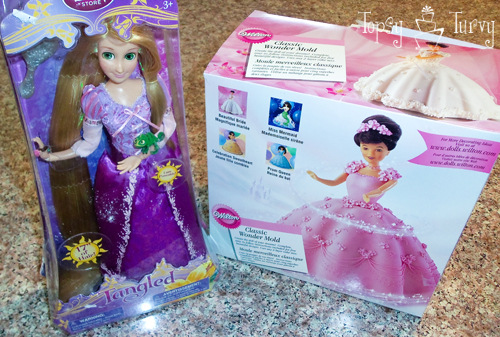 The main supplies are the princess doll you want to make, and Wilton Wonder Mold cake pan. This cake takes a while to cook because it’s so thick. Make sure you use the metal tube down the center for even cooking. If you leave it out the cake will fall. Not pretty. I’ve had this pan for years, But somehow in the last few month I lost a key piece, the screw on the bottom. I emailed Wilton and they immediately sent on to me! It was terrific service! First we need to do the prep work. We need to cover some cake boards. We need one cake board the same size as the the cake itself. Then we also need 2 or 3 cake boards stacked together for the decorative board. Don’t use just one, it will be too thin and too weak. I’d make these 2-4 inches larger than the base of the cake, depending on how much of the cake base you want showing. You don’t want to put the cake directly on cardboard, it will get soaked. So I cover it with foil! Wrap it around the back, trim and then tape it down. Let’s start with the decorative cake base. You want to start by covering it with fondant. In order to get it to stick and STAY on the foil covered board I use corn syrup. I rub in all over the board before I cover it! You can leave it like that OR you can make it decorative like I did. 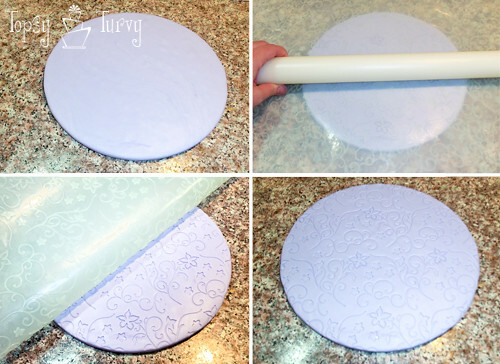 I used an Imprint mat, put it on the board and rolled the rolling pin over it! Peel it off and you have a detailed bake base! Take the cake sized cake board and cover it with some frosting so that the cake will stick to the board. And put the cake on the board! And frost the cake! I totally forgot to take a picture of that part! I always forget one picture in every tutorial it seems! For any of the Barbie cakes what we need to start with is start at the inside/bottom and work your way out/up! So the underskirt is where we’re starting. Rapunzel’s underskirt has a lot of detailing in it so I decided to roll the fondant out onto an impression mat and then used that to cover the cake! As you cover a cake the fondant tends to stretch a bit so to keep the details I just focused on keeping one section pretty, the rest I didn’t mind if the impression got stretched and warped. Back to the design, next on the out/up is the outer skirt. It’s the same purple, but it’s more simple. So I rolled it out and wrapped it around the base. Before I started wrapping I made sure to add clear vanilla to the base fondant so that the outer skirt would stick! Cutting it at the bottom and straight edges in the front. Don’t worry about the rough edges, we’ll cover them later. Next up? The sleeves. Her dress has sheer sleeves. Since I can’t get completely sheer I did roll it out as thin as I could, see… You can see the writing through the fondant. Cut it down to strips, about the width of the arm. Paint it with clear vanilla and carefully wrap it around her arms. Trim the edges under the arm! Now for the bodice. Paint her body with clear vanilla. I should mention why we’re using clear vanilla, or vanilla at all! Vanilla is mostly alchol and so it dampens the fondant and makes it sticky, but it also evaporates quickly so it dries quickly too! If you use regular vanilla the brown could dye or show up if you get it on any of the fondant that shows!. The clear vanilla won’t leave any marks! Now using a sharp knife trim the bodice into shape! 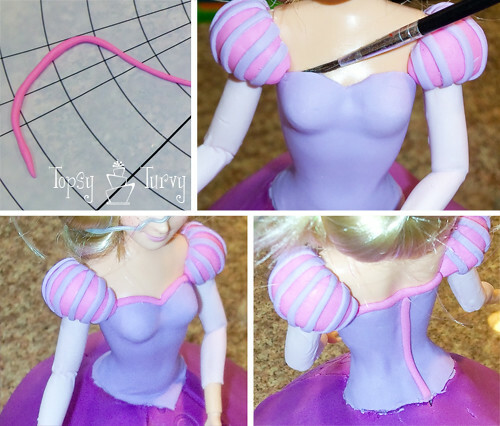 Remember you can do any princess you want, so use the colors and bodice shape of the princess your trying to make. Her puffy sleeves. I started with 2 fondant balls to make sure they are equal and match. Then I started shaping them! Add the vanilla and add it to our princess! Now we have the base design complete. You could leave it here for a decent cake, but to take it over the top it’s time to start working on the details. That’s what really makes the cake. The pink trip details around the bodice neckline an cover the seam line in the back. Cover the seam where the bodice and skirt meet… And now time to add the criss crossing of the ribbon onto the bodice. I rolled out the pink really thin, and then using a pizza cutter cut it really narrow. This way I didn’t have to try to roll it evenly into such a small snake! I painted the bodice with clear vanilla (see, you can’t even see it!). Now one strip at a time start cutting and building the criss crossing! And for the final details: I added a bit of white around the neckline, added some purple between the puffy sleeves and “sheer” sleeves, some detail at the ends of the sleeves, the edges of the outer skirt, the base of the dress AND the bow at the top of the criss cross lace up front! Her skirt is all shiny, so using a brush (not one you EVER use with paint or make up or anything, JUST for food!!! Anyway, use the brush and edible glitter, or luster dust! I brushed it all over the skirt, bodice, etc… It adds that final shine/glow to the dress. Undo her hair, add her tiny gecko and paint brush and Presto! She’s done and gorgeous! This is sooo cute Ashlee! 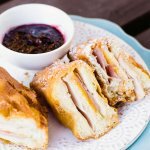 I love these cakes – they are amazing! Thank you so much! I really enjoy creating cakes! It is so much fun! I’ve been baking for years. But it’s not like riding a bicycle. If you get out of practice, you’re going to forget certain important aspects. Thank you Ashlee for this tutorial. Without it, I probably wouldn’t venture into this ambitous beautiful work of art again. I made a Barbie for my daughter years ago. 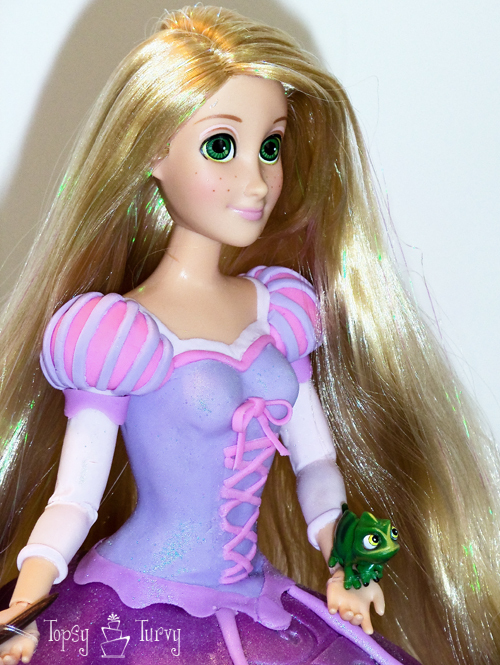 But this Rapunzel for my granddaughter is going to be way better thanks to you. Thanks for not hiding your genius. you are so kind! thank you so much. good luck and have FUN! Everyone was blown away by this cake. No one thought it was a cake, especially the 5 year old who tried to grab it and stick her finger in it! You did an amazing job, and my husband was super impressed by the bodice as was my mom. They thought the doll came like that and it was molded plastic or something. Really great work Ashlee. You are a true artist! Thanks for the chance to do it! I’m so glad she liked it! I was a bit worried how the bodice would turn out, but I ended up really pleased with it! I can’t believe how talented you are.. hop e you are making money.. the bodice.. was amazing… I would like to know how to make the dr. seuss pops hats.. for myson’s dr. seuss day at school. Sometimes. Not always. I tend to do most of my cakes for family and friends or barter. But in the end I really enjoy doing them. For the cake pops- I rolled the cake/frosting mixture into a ball, then rolled them into a tube. Then dipped the whole thing in white and let it dry. Then dipped each end in red, letting them dry on end. And once that cooled pipping more white around for a brim. Then stick them on sticks~! Good luck! From TCB – you cake this cake look so easy! Truely amazing! Thank you so much! I hope I make it look easy, the point is to make it look doable! I’m glad you like them! From TCB – I never though I could do a cake like this. Very cool! Maybe one day when I have kids I can try it. 🙂 Thanks for the tutorial! You can totally do it! It’s all doable when you know the steps! Wow, that’s phenomenal. I don’t think I would have the patience for that. I am learning, but wow. Thanks for sharing your artistry. thank you so much! It was a really fun cake to do. But really not as hard as it might look, just very time consuming! 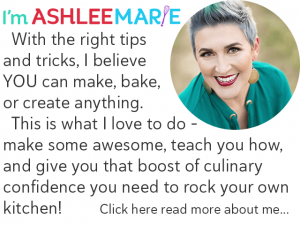 Ashlee – Amazing!! I came to your site today to specifically get your email so I could ask if you had a tutorial for the Princess Tiana cake which I have had a pic of in my “inspiration” file. My daughter is having a Princess party for her fifth bday this summer and I want to do that cake for her. This helps alot. I have done a lot of cakes but I am a buttercream girl and I have never done fondant. Any tips for that you have to do Tiana I would love as well. You are a true artist and have inspired me to “up” my skills this year! Thank you so much! What a wonderful complement! My advice with Tiana, cover the skirt with the green, cut out long petals for the next layer of the skirt, do the bodice next. for the draped part of the skirt make sure you roll it out and use it right away so it’s fresh and won’t crack. Then cover the mess at the waist! Voila! I hope that helps! that one I used for the skirt is from Wilton. My favorites are FMM impression mats. I get all my stuff from online. I’m sure you have someone close to you who can ship cheaper than the UK or USA companies I use! Thank you for sharing your TALENT and not being greedy! I mean your actions speak for themselves, you are giving and beautiful! I am 36 weeks pregnant and planning to make this doll cake for my 4 year old. Your tutorial, takes so much stress of my shoulders! THANK YOU ONCE MORE. MAY YOUR HANDS BE BLESSED w all that they touch! your so so sweet! I know that some people like to protect their work, but I just want other women to enjoy making cakes for their children as much as I do! for me it’s all about fun! If it’s not fun than why do we do it? I love sharing and helping and answering questions. Let me know if I can help in any way. Actually I do have a question(s). How big of a circle, do I need to roll the fondant so that it covers the whole cake? 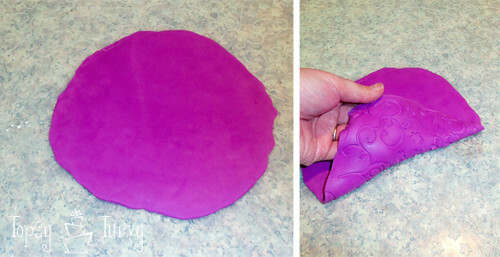 I have the wilton circle plastic mat, but can’t get it right. I usually start w 1lb of the pre made wilton fondant, is that the correct amount too? So, how big the circle and what should be the diameter of the circle? Ummm I don’t recall, I just roll out a huge circle and lay it on! Sorry that’s really no help. It’s not as big as the circle mat that’s for sure. I like to keep my fondant about 1/4″ thick for laying over cakes. But I NEVER use Wilton Fondant, I always use Satin Ice Fondant, I’ve heard good things about Duff’s fondant too, but have never tried it. I always start with more fondant than I’ll need for the circle though, I don’t work with lbs I work with handfuls. And I would start with about 2 baseballs worth of fondant for a basic cake size. Of course there will be excess but better too much than too little. I am trying out my own Rapunzel cake on a much smaller scale, of course. I am using the Wilton cake pan w/ 1 box of Betty Crocker cake mix and I cannot get the cake batter to bake high enough. So when I insert the doll in the skirt it’s like 2-3 inches too short. any suggestions? Why smaller? That’s the same pan and doll size I use! I would always suggest taking the legs off, all barbie legs are too long for the cake pan, they do that so you’ll buy their doll picks and NOT use barbie dolls. Also I don’t like using box cake mix for cakes because the cakes are simply too weak to hold up against carving, doll legs, the weight of fondant, etc.. But if it’s your only option try 1 1/2 boxes to get as much height as you can. 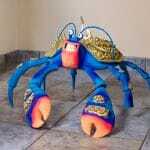 If you HAVE to keep the legs on like I did for this one don’t forget to ANGLE the legs. Start at the center and push the toes to the outer edge (I like to push towards the back so if they stick out a bit it’s not as big of a deal). 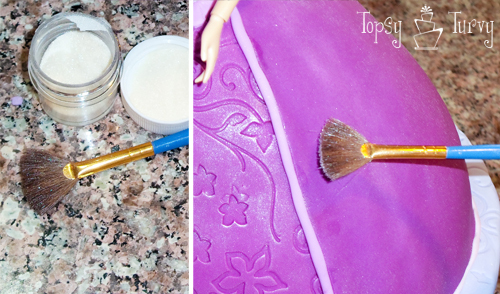 If it’s still a bit too short use some fondant to “build” up the skirt a bit before adding the extra layers. 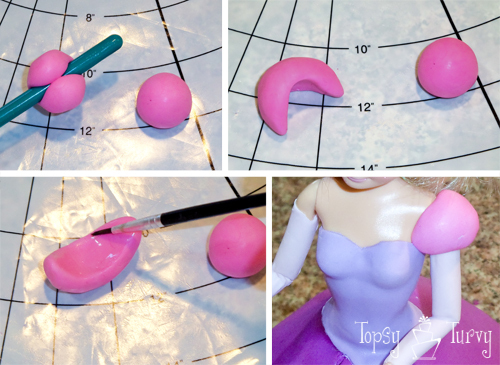 Yup, I’ve done that with these other tutorials – Elsa, Anna and Merida, but since Rapunzel is younger I didn’t want to make her too tall, and her skirt is usually ankle length, I tried to figure out how to lift it up… maybe next time! Absolutely beautiful!! And so amazing that you took the time out to explain how you did it, thank you!! Thanks! I’m so glad you like it! Let me know if you try it, or another princess based on it! Thanks for the great tutorial. My first doll cake with fondant was well received. I used your tutorial and two others that were very similar. I made many mistakes and had to cover them up! Lol. It was fun. I think I could really get into this! Thanks! I’d love to see a picture, either email or add it to my facebook page. I’m so glad that my tutorial helped you in some way. Thank you so much for the detailed way in which you did this tutorial, i never thought i could do Rapunzel but i proved myself wrong, if only i could post a pic so you could see what your tutorial produced from me!!!! Could you tell me the coloring you used for the skirt and bodice ? you know I don’t really remember. I own about 20 gel colors and usually use a mixture to get the coloring I want. I just took a doll’s dress and started adding pink’s and purples here and there until I was happy with the results! Sorry to not be more help! But def go with powder or gel coloring, not the liquid food coloring. Thanks for the write up, mine was not as perfect but definitely presentable, my girls loved it. It turned out great! you did a fantastic job! I’m so glad it worked out! I rolled out a super large piece of fondant, way bigger than I needed, added the clear vanilla to the under skirt only where I wanted the fondant to stick. Then I laid the HUGE piece around the skirt, kind of like wrapping a fat ice cream cone? It should overlap on the top and bottom. Then taking a sharp knife I carefully cut off the excess from the waist, bottom and of course cut the portion in the front I wanted gone. Does that help at all??? I hope I’m not to late! Thanks for your prompt reply – not too late at all! Fab, I will give it a go, thank you. Loving your cakes by the way – they are fantastic! Thanks for your help. I hope it was helpful and your party went well! Love this cake, I have a customer who wants me to make one for her 4 yr old daughter but is not keen with the hair on the doll. Did you have any issues with the hair from the real doll on the cake at all? Did the hair come out of the doll on to the cake? I’m not real good at making fondant figures and would just love to do this cake with the actual doll. About how long from start to finish did this take you? Thanks for posting this, excellent job! Since I used fondant, not buttercream I had NO problems with the hair sticking to the cake! While I was making it I had the hair rapped up in a bun, when they cut it they can do the same, but honestly just pulling out the doll for cutting is easiest! Because I kept stopping to take pictures it took longer than normal. I’d say a few hours… depends on how familiar you are with fondant. Feel free to ask any questions you may have! Thank you so much! It was a fun cake to make, and fun to share with people! My favorite has been when people MAKE the cake from the tutorial and send me pictures! Your work is amazing! She looks flawless and just like Rapunzel. I am trying to bake a cake like this for my niece and you have given me a great tutorial to work with. Thanks so much…keep up the good work!!! Hi ashlee! I’m in the middle of making this cake for my neice’s birthday. How did you make the bow? This is my first time with fondont. Your tuturial makes this cake very doable! The bow on the top of the dress? I rolled out the fondant really thin, then using a pizza cutter cut a very narrow strip. I made two loops, and let them dry a bit, along with 2 “tails”. I “glued” them to the bodice using clear vanilla. finally I used a bit more of the fondant strip to cover where they all met, like the center of a bow! I hope that help sin some way! Thanks for replying, I will certainly let you know if I need help with anything that’s not clear to me. Great! I can’t wait to see how it turns out! Hello Ashley… Happy Thanksgiving to you…I have one quick question..How much Fondant did you use to do the clothing for the doll overall. What are the colors you use to color to fondant? Ummmm I’m not sure. I make so many cakes I don’t keep track of stuff like that. my guess? about a tennis ball size for the dark shade for the skirt, about the same for the underskirt/bodice if not a tad bit more, and tiny amounts of everything else. As for color? I have about 20 gel food colors and tend to blend my own, just start adding a bit at a time, shades of pinks, purples, blues and eve some reds until you start getting the results you like. Sorry I’m not much help! I didn’t put a recipe on the post. I assume people have their own preference for flavors. I never EVER use a box mix for a cake, I prefer working with dense cakes that are easy to carve and hold up the weight of fondant easily. Wilton- (they make the pan) makes almost all their pans to fit one cake mix. So about 4 cups of batter. I tend to add extra batter so I have a bit more height to work with. 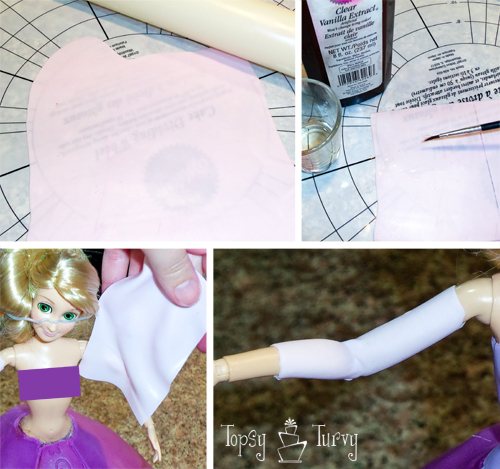 If your using the doll pick that doesn’t weight much a box mix will work just fine, but if your using a rapunzel doll (with or without legs) you’ll want a stronger cake to help hold it up! Hello, I must say that I love r cake and would like to make it for my daughter. How far ahead of time should I make it? Sorry for the late reply- I decorate my cakes the night before if I have to but the morning of usually! Where did you get that specific rapunzel doll? LOoks great! I honestly have no idea. The mother of the girl the cake was for ordered it online and had it sent to me. It was over a year ago now so I doubt it’s not as easy to find. Hi! I really love this cake! 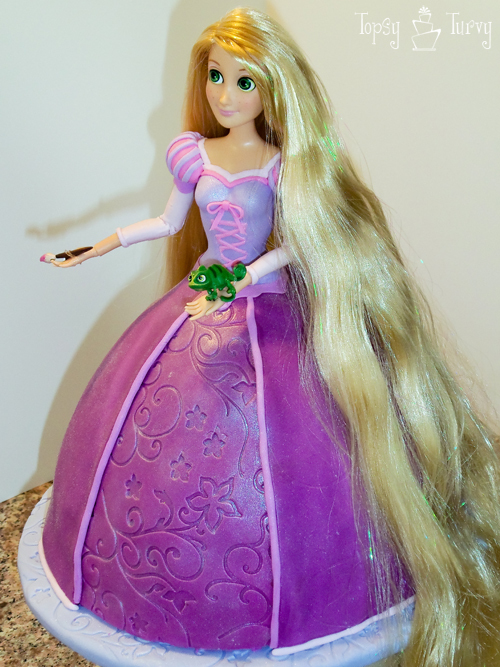 I have two daughters, who both want a princess-themed birthday party this year, once Cinderella and one Rapunzel. I attempted a Barbie cake for a birthday last year and I failed miserably! I didn’t get the wonder mold kit and tried to do myself! Never again! I consider cake decorating to be a hobby. I mostly do it to save money (I have 5 young children). I haven’t really worked with fondant before and I was wondering if there was a fondant you recommend. I have tried the Wilton ready-to-use fondant and I didn’t care for the taste or texture. Is there a way around that?! I have also tired making my own out of powdered sugar, but I didn’t care for the taste of that either. I would greatly appreciate any advice and suggestions you could give me! Thank you so much!! You are extremely talented! That’s why I started to, to create fun cakes for my kids without spending a ton! I would def stay away from wilton, it’s not great (but I’ve heard they are working on a new recipe I want to try). I’ve heard that the Duff fondant is easy to work with if you warm it a bit. I love love LOVE Satin Ice, best fondant I’ve ever worked with. And have been dying to work with MASSA fondant, I hear it’s amazing. Personally none of it is really appealing to me to eat, just a huge chewy wad, but love how it looks on cakes! Also work with a dense cake, not a box mix that will help a ton as well! Where did you get the mat with the dress detail? I would like to make this cake for my daughter, thanks. Also I want to make a Belle cake and Pocahontas cake… Any tips? Mmmmm I think it was a wilton mat, I used to teach and I believe I got it at a teaching conference. But years ago… Tips for other cakes, start on the underneath layers, skirt yellow, boddice yellow. Then when you have that done start slowly adding extra peices little by little until you love it! Not sure how to even start a pocahontas cake, with her short skimpy skirt??? I like working with dense homemade cakes, pound cakes are a great way to go too, nothing too light and airy or it tend to crumble when you put the doll in. Hi Ashlee! 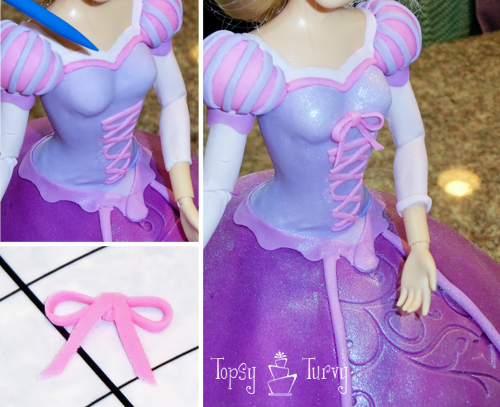 so pleased to “happen” on this tutorial, as I’m supposed to be doing a Rapunzel for this weekend….I also haven’t worked with fondant, but have heard some good things about the homemade stuff with marshmallows, have you used that before?? Your cake looks super–it’s great inspiration! But i have a feeling I’m going to have to do a lot of improvising *sigh*….oh well, like I said, it’s good inspiration and I appreciate the photos and tutorial, thanks!! So I just need to decide whether to buy some fondant (thanks for the tips in the above comment! 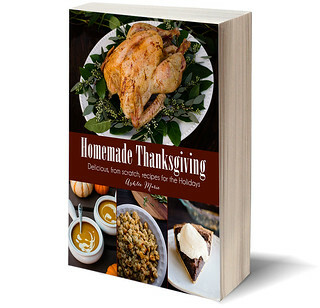 ), make some, or stick to buttercream! haha! 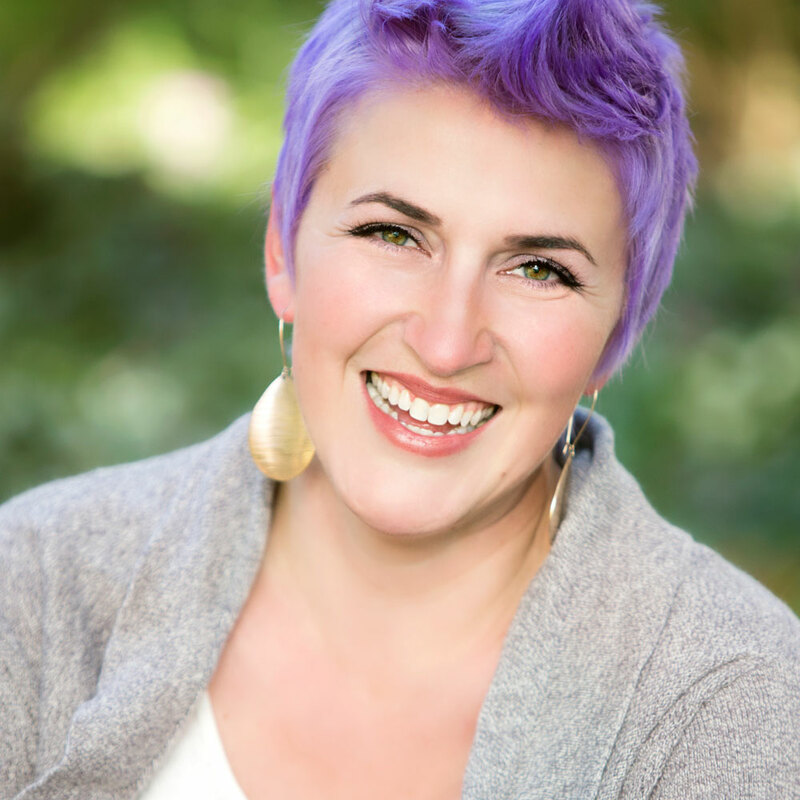 just wanted to say thanks, and was wondering about the marshmallow fondant…. I hate hate HATE the marshmallow stuff, Wilton fondant is also a nightmare to work with. Satin ice is affordable and easy to work with and I’ve heard great things about Duff’s fondant as well. The best stuff (massa) is more expensive and hard to find, but the good stuff works just great! making the cake your own is totally fun it’s not like the birthday girl has seen my cake, so they’ll be tickled with whatever you do! Have a GREAT time! So did you make the lizard and paintbrush or did it come with the doll? I just finished a cake like this. 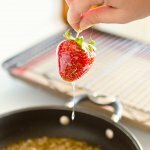 I know you like to see our work after your tutorials but I wasn’t sure how to post to your blog? I have just looked at your cake you have done a great job, I have one on the Craftsy site and someone put your link on it so here I am. Mine is only loosely based on this doll which by the way is very expensive to buy here in New Zealand. I completely understand what you are saying because that is how I work too. Great cake! You can always learn something new and I have today. Thanks so much! I know the doll is hard to find here now as well. Last year was a much easier year to find them! WOW!! How did I miss this one!! Your cake and your skills are just INCREDIBLE Ashlee!!! I’m throwing Alice a Rapunzel party in June!! I WISH I could pull something like this off!! HA! This was over a year ago! Maybe you just passed over it back then. Glad you found it again, give it a try! Thank you so much!!! Little girls all love this one! My Daughter and niece adore it! 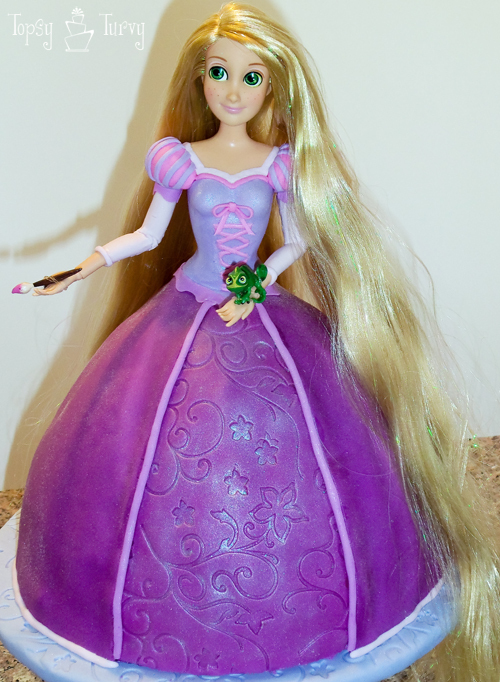 I would love to make that cake, where did you bough Rapunzel doll from? I didn’t, the mother that ordered the cake from me bought the doll and dropped it off. It was a few years ago when the movie was new so dolls were everywhere. Instead of taking the doll’s legs off, I always bake an extra 9″ round cake, cut out a hole in the center and frost the top, trim the top of the domed cake flat, and stack them, trimmimg the sides of the round cake as needed to continue the line of the dome’s curve. I wrap the doll’s legs in plastic wrap before sticking it through. That allows the birthday girl to have a complete doll. I’ve done this successfully with two doll cakes. It also helps the proportions look better because the height of the “dress” and the doll torso match. Thank you for this breakdown, especially of the bodice. It will make doll cake # 3 (Cinderella and Belle previously) much easier for me! I like to take the legs off when I can because it disrupts the cake less, the legs length isn’t the issue, it’s the fact that so much plastic inserted into the cake tends to crack the cake, and I simply don’t like it, but thanks! it SHOULD!! I had to open a few in store to make sure I got one with it. If it doesn’t come with it (or you loose it) contact Wilton and they’ll send you another one! I’m twelve years old I’m planning my sisters seventh birthday party and the theme is Tangled. I have so many ideas and this cake is so perfect I could scream! (With delight of course.) One thing-how do you actually make the cake??? I normally make cakes out of packet mixes so I don’t have a clue and can’t find anything on the Internet. Can you give me details please? Thanks. the wilton pans are sized to be made with a box mix. So just put together the pan, mix up the mix, pour it in and bake! the pan comes with instructions and baking times! Very beautiful. thanks for the tutorial. your welcome! It was such a fun cake to make! Your so welcome! I’m just waiting for the next barbie cake order!!! Wondering as the new slew of parties comes up if I’ll get an order for a Merida (from Brave) cake! Your cake looks sooooo good. What an amazing job! I used this cake pan 2 times already. Both were with Barbie dolls. The cake was chocolate. I never use box mixes since I do not like the taste. I found that I had to bake my usual recipe15 min longer than usual. I used Magnolia Bakery’s Chocolate Birthday Cake recipe. (it is enough for a 9″ three layer cake and fills the wonder mold pan perfectly.) Since it is such a moist cake it didn”t dry out as much when I baked it longer. Instead of angleing the legs I make one additional 9″ round cake layer and put it below the wilton mold cake. This usually means doubling the recipe. Even after 25 extra minutes. Please help! Could you share your vanilla recipe with us? I don’t know how to post a photo of the cakes I made…I would have liked to share. These cakes were such fun to make. totally, I haven’t used wilton fondant or gumpaste in years, but I love their pans! I’m not a fan of box mixes either and do all my cakes from scratch. I haven’t tried a belle cake yet, but with that amazing dress she wears it’s the perfect one to try! I have done the extra layer before, but not everyone wants that much cake, so I didn’t want to confuse people, or make them think they had to do that to create this cake. But it is a great solution to the leg dilemma. Has anything changed since the last time you baked a cake? have you moved? high altitude is a KILLER on baking. Did you lose the center metal rod? I did that once and the center fell badly. 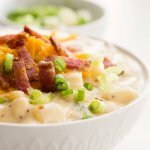 I have a few dozen recipes I use, depending on what I’m using it for, The white cake I use the most often is from the “joy of cooking”, but it has not worked for me at the altitude I’m currently living at. but my chocolate has worked great so I use it most often. you are more than welcome to try anything you want, this is just the way I do it. Hi, my 7 year old wants a Rapunzel cake and thought I could probably do it myself. But what I want to know is how far in advance can you make it? I want to be able to make it a day or so before just in case it dont come out and I still have time to order a cake LOL! BTW your cakes are awesome! you can totally make it the day before, just don’t refrigerate it once you put the fondant on. when it cools it will get condensation on the outside and completely ruin it. You are talented. I was wondering what colors you used to color the fondant? or what color fondant did you buy? I just want to get the right colors right. I own about 60 gel colors, and this was years ago, so i can’t say for sure what I used. I used a few different pinks to get the shades I wanted. just start with a little at a time and experiment! hi, this is truly an informative tutorial! Thanx for sharing! thank you so much, it’s a really fun cake to make. make sure you use a really REALLY dense cake. 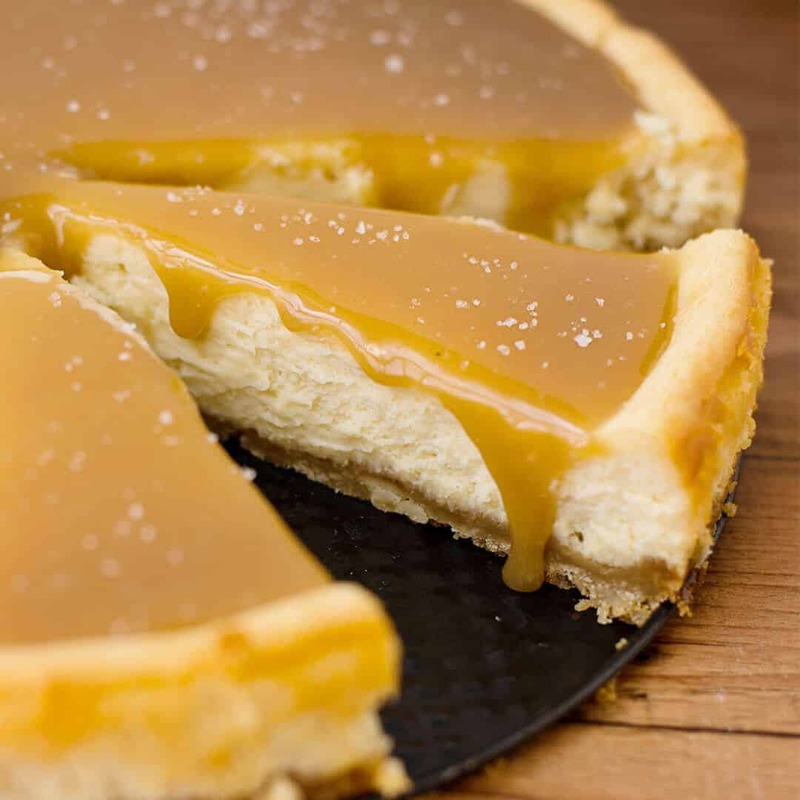 once you start carving a cake it loses a lot of it’s strength from the outer “crust” if you will. And carve frozen, and a little at a time, you can always take off more, but can’t put it back on once it’s off! have fun! Amazing cake! can you please tell me how you got the colour of the skirt? I really need this exact shade!! oh I’ve just seen your answer to a similar question!! thanks for sharing your tutorial! I used a mix of a bunch of different shades. I use gel food coloring I used a few shades of pink. I usually take a little ball of fondant and color it until I’m happy with it, then color a larger swatch (that way you don’t waste fondant on the wrong color. I am going to attempt to do your wonderful Rapunzel cake for my daughters 5th Birthday next month & was wondering what colour luster dust did you use? it’s all new to me so I hope it works out! Ummm prob just the pearl luster dust, maybe the silver. those are my go too luster dust colors. the mom of the birthday girl ordered it, years ago when it was popular, and had it sent to me. last time I checked you can still find some on amazon. I’m 12 and I’m planning a Tangled party for my sisters 8th in march. I am going to make this cake but I’m not exactly a cake maker-y person so I was wondering (this is going to sound stupid) how did you make the cake itself, like I need some set in stone step by steps to help me. Thanks in advance! Oh and the party is going to be a surprise for everyone so could you give me the length of time it will take plz? 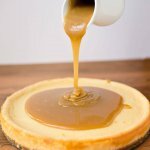 I make from scratch cakes, but don’t share my recipes, as it’s part of my business. If your cake doesn’t rise enough you might need to add another layer of 8 inch cakes. Pound cakes are good, or a sour cream chocolate is usually dense enough. The decorating alone probably took me 4 plus hours. add the cooking, cooling, frosting, i usually do it over 2 days, baking one day, frosting and decorating the next. That cake is amazing! What an artist you are! I am making Sleeping Beauty for my granddaughter on Saturday and had a few questions. Isn’t the doll too tall for the Wonder Pan Mold? It didn’t look like you put another cake under it to stick the doll’s feet in; how did you make it work? 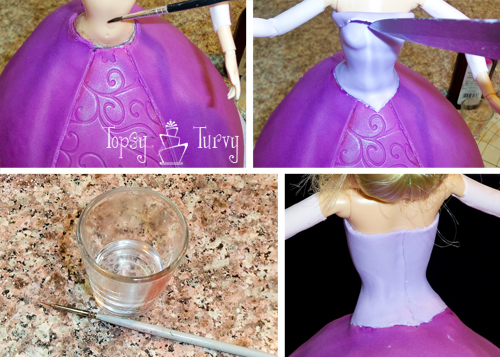 Did you make a hole in the cake for the doll before putting on the fondant? If so, did you wait till the cake cooled? The waist of Wonder Mold Pan looks smaller in diameter than the doll’s hips; does that make the cake break when you insert the doll? Thanks! I am hoping my turns out half as great as yours! Haven’t used this pan in about 25 years and just used the doll pick at the time, but wanted to use an authentic Sleeping Beauty doll for my little princess :)! I put her legs in at an angle, for the Merida cake I made the cake fell a bit and was WAY to short so I added another 8 inch round layer underneath to add height. I do cut a hole in the cake before I stick the doll in so it doesn’t break the cake. After I bake my cakes I wait 10 mins just until they are cool enough to handle and I wrap them in plastic and freeze. That way instead of all the steam escaping it stays in the cake and keeps it extra moist. Then I thaw it a bit to start carving and frosting. It looks very impressive. What can I use as a Vanilla substitute that has no alcohol. I use vodka, it’s cheaper and works better, but clear vanilla works okay, I wouldn’t use anything with a high concentration of alcohol. you put it on and it dissolves a bit of the fondant as it evaporates leaving it tacky, but the alcohol doesn’t stay, it evaporates. I have known some people try a bit of water, but it doesn’t dissolve the fondant or leave it sticky it tends to just be wet and slippery and the fondant/gumpaste doesn’t stick very well. How much fondant should I make for this cake? Is one batch of marshmallow fondant enough? (1 lb marshmallows, 2 lbs powdered sugar). I don’t use marshmallow fondant, I buy my fondant 50 lbs at a time. I’d say 2 softball sized balls of fondant would be enough? I usually say a softball sized ball for the skirt alone, and because this has the extra skirt layer it takes a little more, the rest, bodice, arms, details, etc… doesn’t take very much. Sorry, me again 🙁 I rented the wilton wonder mold pan from my library, and there is no rod … is there supposed to be a metal rod in order for it to bake evenly? Is there something I might be able to use instead? I have only ever made 4 cakes before in my life but really want to try to make this for my daughters 4th birthday – bound to be a disaster – ha ha ha. Had a silly question 😉 (I live in UK) Once you have baked the cake do you add a thin layer of buttercream before putting the fondant on? Also when you mention clear vanilla is this the same as Vanilla Essence? Thank you so much for your help!! but i’m american and live in norway, and have had to learn all the “substitutes” here for american baking things. before applying fondant, you DO need a layer of buttercream so the fondant has something to stick to 🙂 place it in the fridge to harden a bit, then smooth the buttercream out with a fondant smoother to get the smoothest finish to the dress. not sure about clear vanilla being the same as vanilla essence BUT you can get clear vanilla from a baking store. i got some here! if it’s vanilla and it doesn’t look like water, it’s not the same 🙂 good luck! Hey thanks for stepping in and answering questions. I actually DON’T ever use buttercream under fondant, just Ganache. Buttercream is too squishy, soft and a little melty. So I don’t like to use it. While ganache holds it’s shape great, and is nice and smooth under fondant and once it sets you don’t have to worry about it melting. As for the clear vanilla I actually use vodka usually, it’s cheaper and what you really need is the alcohol, the vanilla part doesn’t matter, but some people like the sound of clear vanilla over vodka. hey, sorry for the late response, I only respond every other month these days. And no question is silly, so your good! I do NOT add buttercream. I NEVER add buttercream under fondant, it’s soft, squishy and tends to melt out the bottom and doesn’t hold it’s shape. What I us is GANACHE once it sets it holds it’s shape great. Honestly I usually use vodka, it’s cheaper and works better than clear vanilla, BUT some people get offended by me saying that so I say clear vanilla. The alcohol in the vodka eats a small layer of the fondant and makes it tacky so the fondant sticks to fondant! The Rapunzel cake turned out beautiful! I was able to get all the fondant, etc, in local shops in Ireland. I now know how to roll fondant! My 3 year old will have the best bday. The cake could have looked a bit more professional but I let my 4 year old help with the decorating. Much better to have a cake a little smudged by a 4 year old than a perfect cake with the 4 year old being banished from the kitchen. Thank you for your website! I just googled Rapunzel doll cake and found your website in the first page of search results. I’ll try another cake for the next bday in our house! I have a ton of little helpers in the kitchen too! While I keep them away from clients cakes they do love helping with just for fun cakes and I bet it looks AMAZING! Email me a picture or tag me on social media, I’d love to see it.